WANOOETECH's PNSS series Shredders are used for pre-crushing of materials like plastic barrel, plastic drum, plastic bottle, PP woven jumbo bag etc., which are hard to crush using common granulator. The Pre-crushed materials can increases granulator's capacity, life time of granulator's blades. Our Shredder is equipped with SIEMENS PLC intelligent controlling system, it has the features of automatic stop, reserve direction run and alarming functions in case of possible material block, metal escape or overload. The PNSS series plastic shredders and PNSC series strong crusher machine can compose a shredding system, they can meet any customers plastic size reduction requirement from 4mm to 50mm. If necessary, using our PNHS series plastic pelletizing line, customer also can make the recycled grinded plastic chips into plastic granules, which can be used in much more field. 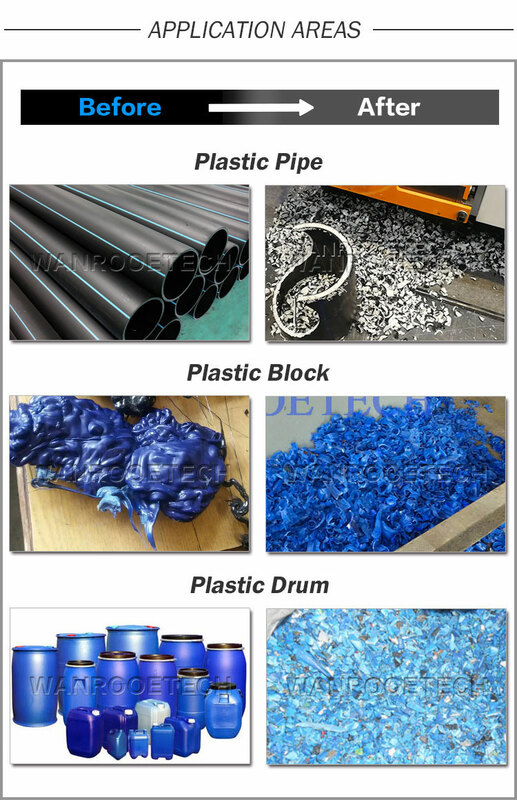 Here, WANROOETECH can supply you turn-key solutions plastic recycling solutions from waste dirty plastic to clean high quality recycled plastic granules. •After informed machines ready for inspection, customer can send engineers to WANROOETECH; Customer also can consign WANROOETECH to finish inspection work. •When the machines are delivered to customer’s factory, please arrange preparation work before engineers arrive if require. •Technicians will be responsible for guide on-site installation and testing machines involved. •Meanwhile technicians will give free training lessons to labors in customer’s factory. •The customer just needs to bear expenses generated for this work, e.g. airplane tickets (round-way), residency, meals and allowance of USD50 per day for each technician.